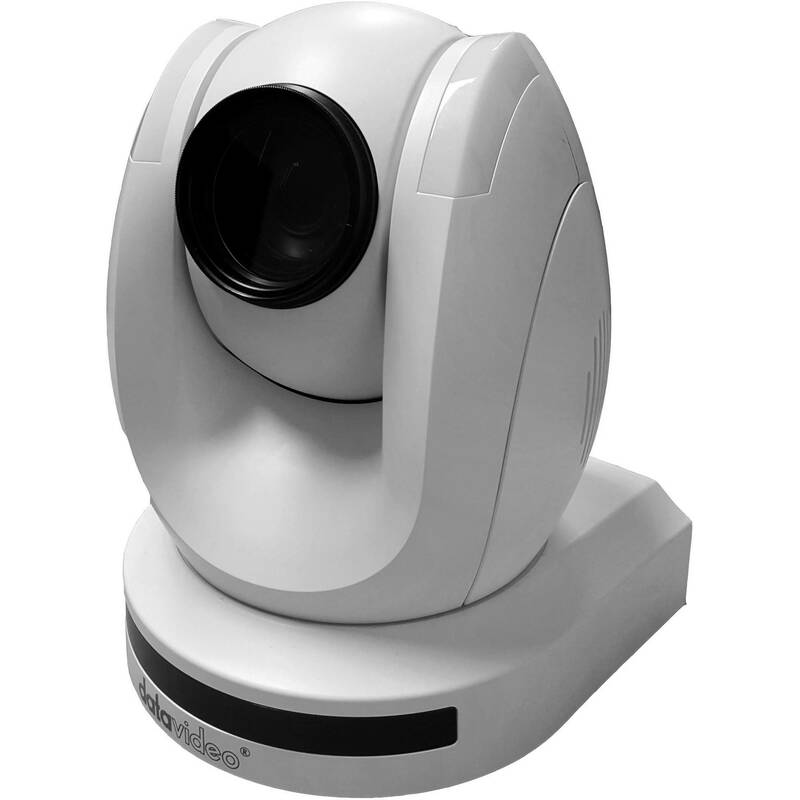 The white PTC-150 HD/SD PTZ Video Camera from Datavideo captures HD video at up to 1920x1080p resolution, and features wide dynamic range with backlight compensation. It can be mounted on a wall, ceiling, floor, or tabletop, and includes an IR remote control. The PTC-150 features motorized 30x optical zoom capability. Its image-mirror and image-rotation functions allow you to electronically adjust the image to help compensate for mounting limitations based on your location. There are 50 programmable position presets including pan, tilt, and zoom positions; these allow the camera to move quickly between predetermined camera positions using the remote, or an optional PTZ controller. For multi-camera shoots, the built-in tally light can identify when the camera is active. The camera features a built-in IR cut filter in the image path for low-light shooting, and then returns for daytime shooting. Moreover, the PTC-150 supports real time position report on a per frame basis; this is helpful for virtual studio applications. The camera supports Sony VISCA protocol for PTZ control using RS-422 interface over the unit's RJ-45 port. Box Dimensions (LxWxH) 13.4 x 12.2 x 10.9"
PTC-150 HD/SD PTZ Video Camera (White) is rated 5.0 out of 5 by 1. Rated 5 out of 5 by Anonymous from This product is just what we needed! We use the PTC-150 camera for recording our sermon messages, which are available on our website after each service. We will also be using this camera in the next few months to support streaming our entire services on line. Will this camera work with the Vaddio ProductionVIEW Super Joystick? Sorry, no. It will work with a Datavideo controller like this one. Datavideo RMC-190 Camera Controller for PTC-120 B&amp;H # DARMC190. is it 4:1:1 or 4:2:2? This camera is listed as 4:1:1. Can the tally light be disabled? I use mine without the tally lights. Didn't really do anything to turn them off, just did not hook up tally cable.